News of a child dying in a hot car is absolutely heartbreaking. Even worse is the thought that these deaths could of been prevented if someone had taken action. Much discussion around preventing child deaths in hot cars has involved which action adults should take. But what about the children themselves. A conversation with your child could save their life and those of another child. 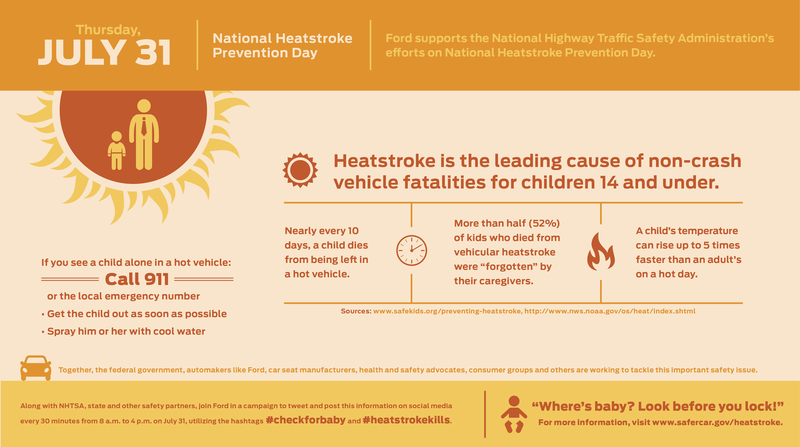 Ford Motor Company partnered with the National Highway Traffic Safety Administration to share information about heatstroke . In addition to the information we’re sharing tips and talking points to use when talking to your child. Last yer, 44 U.S. children lost their lives after being left unattended in a motor vehicle. More than half (52%) of kids who died from vehicular heatstroke were “forgotten” by their caregiver. When the temperature outside is 90 degrees, the temperature inside a parked car can rise up to 109 degrees in 10 minutes, 119 degrees in 20 minutes and 124 degrees in 30 minutes. Make sure the safety seat and belt buckles aren’t too hot before securing a child in a restraint system. Don’t ever leave sleeping infants in the car. Lock your car when you’re not in it so kids can’t climb in on their own. Children should never be left alone in a parked car, even if the windows are open. Don’t let anyone leave you in a parked car and be sure to speak up if someone is leaving you. Tell someone if your safety belt buckles are hot. Don’t ever climb into a parked car. If you see a child or baby in a parked car, tell an adult immediately. Be sure when you are having a conversation with your child to talk to them at their level. Older tweens and teens can be instructed to dial 911 and in some states they can break the car window to get the child out immediately. The most important thing to teach your child is to speak up – speak up if they are being left in a car and speak up if they see a child left in a car. Let’s prevent child deaths from heatstroke together! This entry was posted in Ideas, Parenting Teens, Raising Tweens, Younger Siblings and tagged child safety, Ford, heatstroke, Parenting, parenting advice, Parenting Tips, safety. Bookmark the permalink.